KENNESAW, Ga. (July 2, 2015) — A new partnership between Kennesaw State University, The Brian Jordan Foundation and the LakePoint Sporting Community will work to promote healthier living for children and youth through the creation of The Brian Jordan Center for Excellence and Professional Development. Under a memorandum of understanding signed today, the partners have agreed to create the nonprofit Center to foster national and international education, research, training and programs that provide health benefits for children, youth and young adults through sports and recreation. Among its objectives will be professionally enhancing the knowledge and experiences of future and existing coaches, referees, administrators, and medical personnel working in the area of sport and recreation. To note this historic agreement, Kennesaw State President Daniel S. Papp, along with Brian Jordan, founder of the Brian Jordan Foundation, and state Rep. Earl Ehrhart (R-Powder Springs), addressed guests at a document signing ceremony at LakePoint. Attendees also had an opportunity to tour the LakePoint facility. ​The Center, which is expected to open in March 2016, is a program of the Brian Jordan Foundation and affiliated with Kennesaw State’s Wellstar College of Health and Human Services’ Department of Exercise Science and Sports Management. It will be housed at the LakePoint Sporting Community in Bartow County. Co-branded an “Engaged KSU Community Partner,” the Center will also benefit young adults and homeless families by increasing their knowledge and access to the sport and recreation industries. The new Center is part of a longtime dream of Brian Jordan, a former All-Star player with the Atlanta Braves and an All-Pro selection with the Atlanta Falcons. 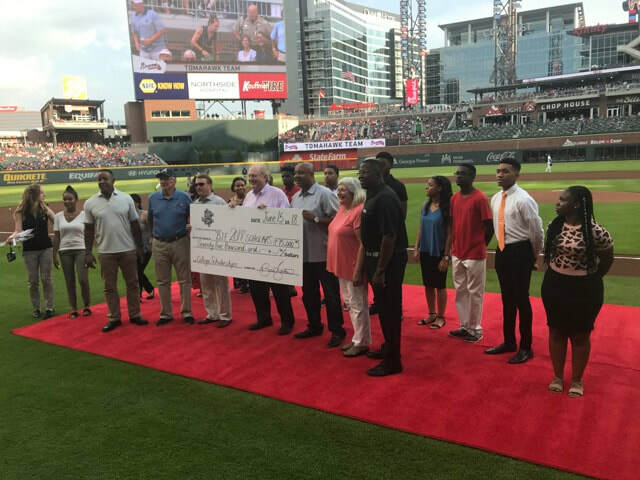 Jordan, who founded the Brian Jordan Foundation in 1998, says that this Center will help him expand his goal to provide young people with positive alternatives by creating programs and building places where they can develop to their full potential. Jimmy Calloway, Kennesaw State professor of sport management and a member of the Brian Jordan Foundation Board of Directors, will be coordinating activities between the three entities to help launch the Center’s activities. He will also be working on community outreach to help raise funds specifically to support the facility and provide opportunities for students from Kennesaw State. Founded in 1998, The Brian Jordan Foundation provides the practical information and tools that children need for restoration, growth and ultimately to become winners in their own eyes. The Foundation is committed to creating and supporting programs for children and their families that will directly improve their quality of life. Located in Emerson, Ga., LakePoint Sporting Community is a multi-use development featuring state-of-the-art sports venues for more than 30 sports, including fields for baseball, softball, soccer and lacrosse and an indoor facility of nearly 200,000 square feet. When complete, LakePoint will offer more than five million square feet of amenities including onsite hotels, restaurants, themed retail, bowling, ziplines and water parks. The Brian Jordan Foundation's "Camp Jordan" has announced two dates and two locations for 2016. The camp has become a highly anticipated event with youth in the communities we serve. The two locations will be in Atlanta, GA and Emerson, GA. The dates are July 16th and July 30th, 2016.